Parents’ thoughts about their children and about parenting are an integral aspect of family interactions. This chapter focuses on various cognitions of parents, including both stable and general beliefs, expectations, and attributional patterns related to children, child behavior, and parenting, as well as more dynamic cognitions that frequently occur in the context of ongoing parent–child interactions. We begin the chapter with an overview of the common theoretical models that underlie the research in this area. We then consider the various types of parental cognitions, highlighting evidence regarding the transactional nature of their associations with parenting and child outcomes. The review of evidence concludes with a summary of the strengths and limitations within this research body, and offers suggestions for future directions. 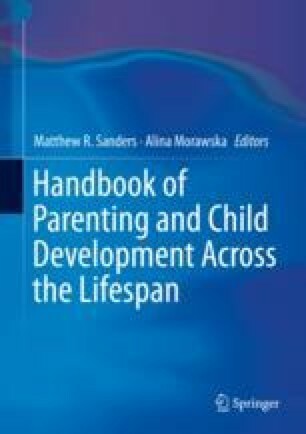 Finally, the last section of the chapter focuses on the clinical implications of understanding parental cognitions and the potential benefits that may accrue if researchers and practitioners listen carefully to the thoughts of parents as they strive to fulfil their parenting role and bring to fruition their aspirations for their children. The writing of this chapter was supported by a grant from the Social Sciences and Humanities Research Council of Canada to the first author (SSHRC 2013 435-2013-0137) and by scholarships from the University of British Columbia and the Dr. William Arthur Paskins Memorial Fellowship to the second author. Disclosure The authors declare that they have no disclosure.